The woman emotionally describes how they did everything possible to deliver a perfectly formed baby boy and stimulated his tiny heart to force one last beat — only to be dismembered and harvested for body parts. I will admit. I had to stop watching the video. I just couldn’t continue. I am sickened and heartbroken. But I saw enough to share in the despair, the anger, and the frustration many of us feel and to sympathize for the many who painfully regret having or participating in an abortion. As Feminists for Life, we give voice to the voiceless — both the woman and the child. It’s time to step it up. We need to reach both hearts and minds before more women enter an abortion clinic, before more lives of women, teens, and their unborn children are lost. We have tools to help you advocate and educate on behalf of women and children. 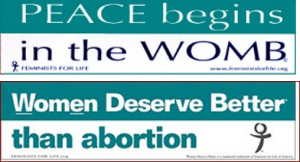 Your FFL membership also comes with a “Feminists for Life: Pro-Woman Pro-Life” bumper sticker. We have placards that declare “All People Are Equal. 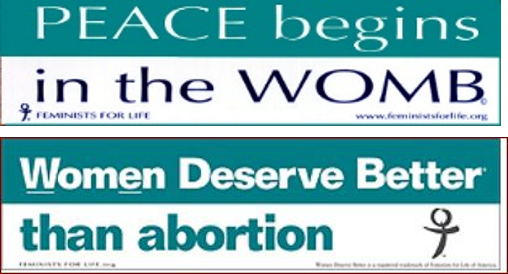 All Choices Are Not” and “Women Deserve Better® than Abortion” on the flip side. We also have these ads– and many more — available as FREE downloadables. 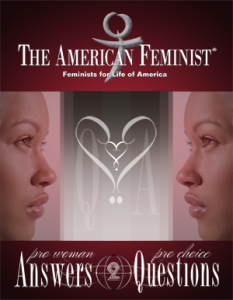 Click here to download these and other FFL Women Deserve Better ads for free! If you are a writer advocating or educating others, don’t forget FFL’s talking points are included with “Pro-Woman Answers to Pro-Choice Questions.” It is also available for purchase. Join the discussion on https://www.facebook.com/FeministsForLife and retweet our messages at https://twitter.com/feminists4life. And while you advocate for the lives of children, ALWAYS remember the woman. Consider how what we say might feel to a woman who is mourning. Our words should always welcome those suffering after an abortion to our movement and help her find healing. And if you are in a position to help us reach the next generation at high-risk of abortion now, and the future leaders of tomorrow, send a kit to campus or sponsor an event. In these dark times, be the light. Because women deserve better–and every child deserves their life!